To read Maisie’s birth story click HERE. 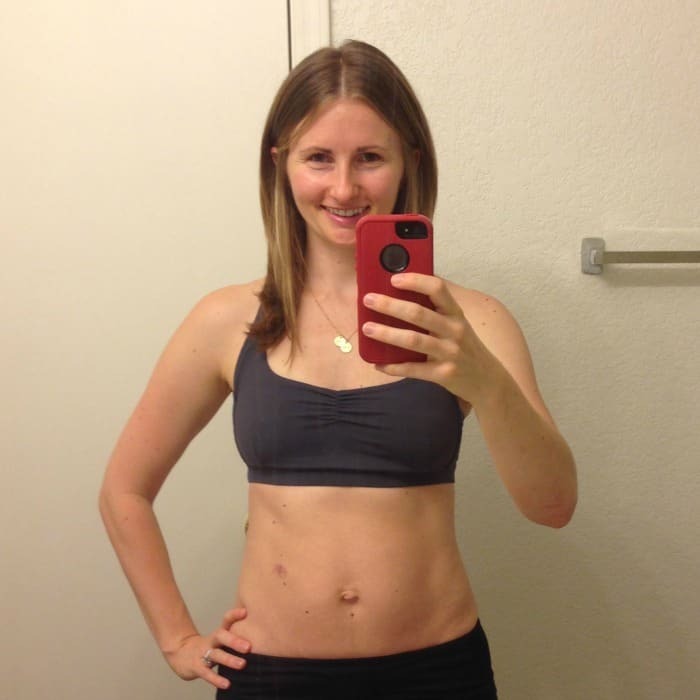 You may also be interested in reading my 1 Month Postpartum Update and 4 Month Postpartum Update. Waist 31″ | Hips 37″ | Weight 133 lb. This is me right now. No makeup and still slightly sweaty from a workout. 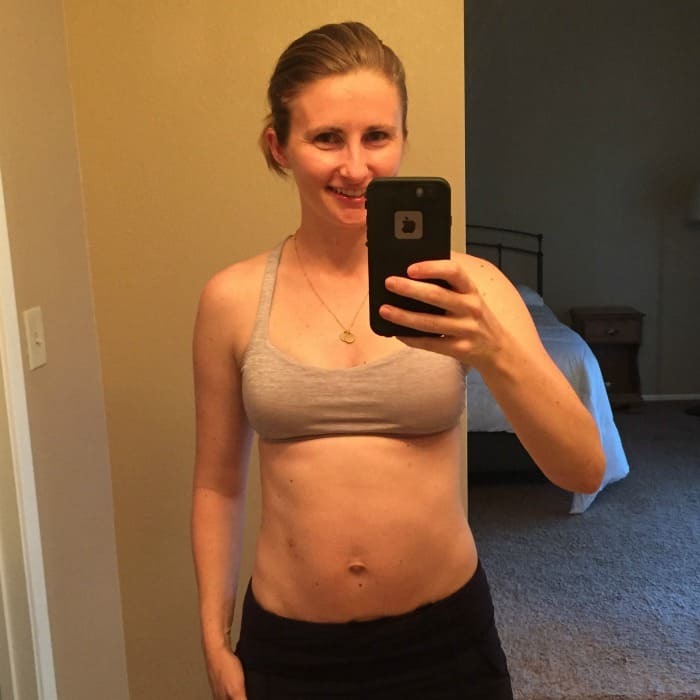 It has been 5 months since my last update and there has not been any significant change in my body measurements but there has been a huge change in how I am feeling. My struggle with postpartum depression and anxiety left me feeling like a shell of my former self. Being brave, talking with my doctor, getting a prescription for Zoloft, meeting with a christian counselor for treatment, and making time with God a priority has allowed me to become engaged in my life again. Back in December I was suffering from horrible lower back. I had never experienced pain like I was feeling which led me to physical therapy. My hips and hamstrings were so imbalanced and sadly my range of motion in my body was drastically reduced. I have spent the last several months focusing on correcting my muscular imbalances with stabilization and strengthen exercises. In April I am going to be eliminating caffeine, sugar, gluten, diary, and alcohol (this one isn’t a big deal for me because I hardly ever drink) for 21 days. Bread is my favorite thing ever and so are cookies. Each time I have done an elimination diet or a juice cleanse I feel so much better. My cravings are drastically reduce, eczema improves, and I sleep better. I will post more details soon in case anyone else would be interested in learning more about why this is beneficial for your body. I realize that my last several posts have not made motherhood sound very pleasant. As miserable as I was feeling a few months ago my husband and our babies are the best thing that has happened to me. I am trying to keep this blog real and honest. As a christian it can sometimes be easier to pretend everything is fine because you don’t want others to be turned off by your vulnerability and rawness. Life is wonderful but it can be hard sometimes. To the moms reading this who have not experienced anything that I have written about. I totally get it. I was right there with you my first pregnancy. I had no idea what postpartum depression felt like or even how consuming dealing with its aftermath could be. To the moms reading this who have experienced anxiety and depression my heart hurts for you. You are not alone in your suffering. I promise. There are so many of us who suffer in silence. Don’t be afraid to ask for help or talk with your doctor. When we judge each other we are forgetting that every person has a unique story. Everyone of us has experienced something that has changed us. Be authentically you. God created each of us for a purpose and a calling. It would be a boring world if we all experienced the same struggles and triumphs. Thank you for your love, kind words, and support over the last several weeks!